A rich array of floor treatments have been used in America s old houses. Finding just the right floor covering to furnish an old house or to create a period look in any building has always been a challenge. 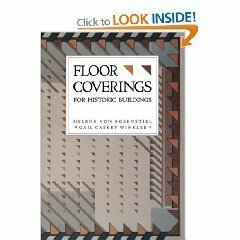 This book explains how to choose & buy the correct floor coverings used between 1750 & the 1930s, including where to order 475 reproductions described here in detail. This invaluable catalog, illustrated with 175 photographs, also provides a history of American floors, a glossary of floor covering terms, addresses for 82 suppliers (many of whom fill custom & special orders), a reading list & sources of help. If you have any questions about this product by Brand: John Wiley Sons, contact us by completing and submitting the form below. If you are looking for a specif part number, please include it with your message.